First-year students at the George Washington University (GW) School of Medicine and Health Sciences (SMHS) gathered in the Marvin Center in mid-December to learn about, and make their mark on, the national HIV/AIDS strategy in the United States. The event, How Clinicians Can Help Achieve an AIDS-Free Generation: Doctors’ Prescriptions for State and Local HIV/AIDS Action Plans, is the first of a series of clinical public health seminars designed to prepare MD students at SMHS for a changing health care landscape. Beginning in the 2014–15 academic year, SMHS began incorporating rigorous clinical public health education into the MD program curriculum. Since then, summit topics have expanded to include childhood asthma, obesity, and, starting last year, fourth-year students are able to choose their own clinical public health topic for a summit project that they can work on throughout their 4th year of medical school. “The summits are a hallmark of our clinical public health curriculum,” said Lawrence “Bopper” Deyton, MD ’85, MSPH, senior associate dean for clinical public health and Murdock Head Professor of Medicine and Health Policy at SMHS. He added that the enhanced emphasis on clinical public health has become an attractive element to prospective students and enables the school to take greater advantage of GW’s unique location in the heart of the nation’s capital. According to Deyton, integrating population health throughout students’ four-year medical education enables generations of GW physicians to develop the leadership and interprofessional skills, as well as the broader understanding of the social determinants of health, necessary to tackle complex problems. Real-world public health challenges such as HIV/AIDS, asthma, and obesity, provide the conduit linking students to public and population health resources and research techniques, and introduce them to local and national public health, policy, and health system experts and decision-makers. Feedback from those decision-makers, added Deyton, is one of the most significant aspects of the summits. Working in teams, students have an opportunity to translate their developing health care knowledge into action, addressing public health and community health issues selected to enrich students’ current curriculum or clerkship rotation work. 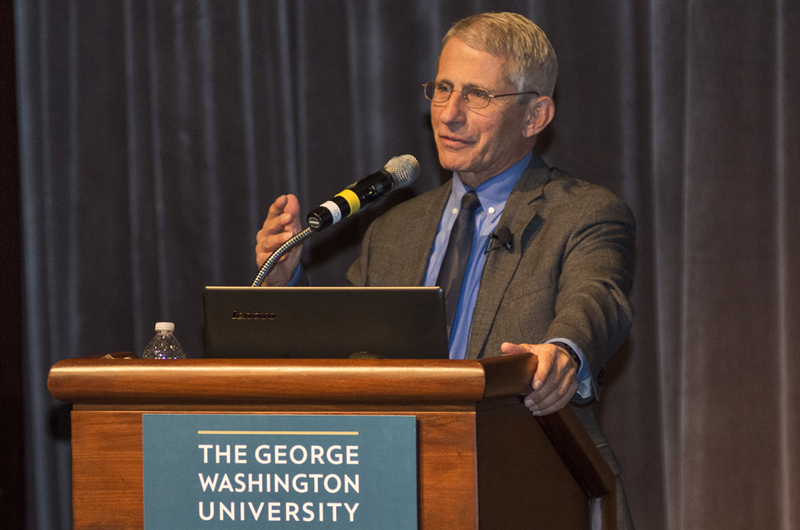 Since the introduction of the clinical public health curriculum at SMHS, Anthony S. Fauci, MD, director of the National Institute of Allergy and Infectious Diseases at the National Institutes of Health (NIH), has been a highlight of the summit on HIV/AIDS. In his remarks this year, Fauci described his decades of work on HIV/AIDs, including the moment in July 1981 when he realized everything had changed. “I can remember that I felt completely paralyzed … because I realized this was a brand new disease I had never seen before,” he said, recalling the emergence of a new, sexually transmitted disease impacting the gay community. In that moment, Fauci’s career path changed. Today, he said, his goal is to achieve an AIDS-free generation through concerted action on multiple fronts. Over the course of the three-day summit, senior HIV/AIDS officials from five jurisdictions in the United States — Washington, D.C.; Louisiana; Arizona; Tennessee; and New York State — discussed topics including HIV testing and linkage to care, HIV treatment, and preventative services. Those leaders worked directly with GW medical students as they crafted strategic plans tailored to each jurisdiction’s HIV/AIDS epidemic patterns, health system capabilities, and community factors. On the final day of the summit, the students presented their plans to a panel of federal and state experts, receiving advice and feedback on their strategies. First-year student Louisa Howard described the summits as “one of the most unique and meaningful aspects” of the curriculum at SMHS. “I was surprised to learn more about the history of [HIV/AIDS] and to hear patient stories about when they were first diagnosed, as well as providers’ accounts of their first encounter with an AIDS patient,” she said.